Composition shingles and laminate shingles are two of the most common types of shingles found on the roofs of American homes today. Each has its own advantages. Choosing the right roof comes down to more than just cosmetics. Composition roofing is flat, single-layer shingles made of cellulose or fiberglass and coated in asphalt or granules. Laminated shingles, also known as "architectural" or "three-dimensional" shingles, are double-layered fiberglass and use combinations of thickness and spacing to create a more distinct look. 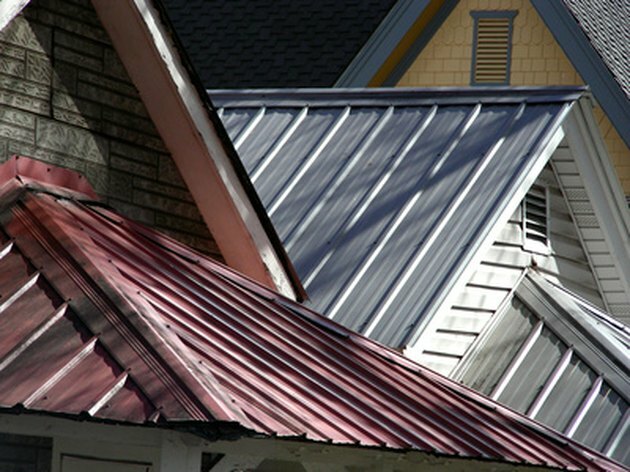 Composition roofing is the most inexpensive type of roof, usually costing around $50 per 100 square feet. Laminated roofing is more expensive to purchase but the extra cost can be made up for with the added longevity. Generally speaking, the heavier the shingle the longer it will last. Composition roofing offers more versatility as lighter color shingles can reduce cooling costs in the home, and algae-resistant granules are available in humid climates. Laminated shingles are more fire-, wind- and hail-resistant and often carry warranties up to 50 years, about twice as long as composition shingles. Christian Worstell began writing in 2003. His work has appeared in newspapers in six different states, as well as "AutoPilot Magazine" and online publications such as Minor League News, Redline Editorial, NY Fan News, North Raleigh Sports and River Hills Traveler. Worstell has a Bachelor of Arts in journalism from Shippensburg University. Will Using Tar Paper for Weed Control Contaminate the Ground? Can Roofing Felt Be Used As Weed Barrier?